This article was contributed by Susan Neigher of the NCJW West Morris Section. The West Morris Section of the National Council of Jewish Women hosted a Fair Trade Fair on April 3, 2016 at the County College of Morris in Randolph. Over 130 people from all over the state came to the event. We had tremendous support from the Coalition, especially from the Justice Network, to pack the venue with Fair Trade vendors. As a special treat, the fruits of the Silhouette Project were displayed. Through a grant from Atlantic Health, the Coalition was able to supply plywood silhouettes to 22 student and community groups. 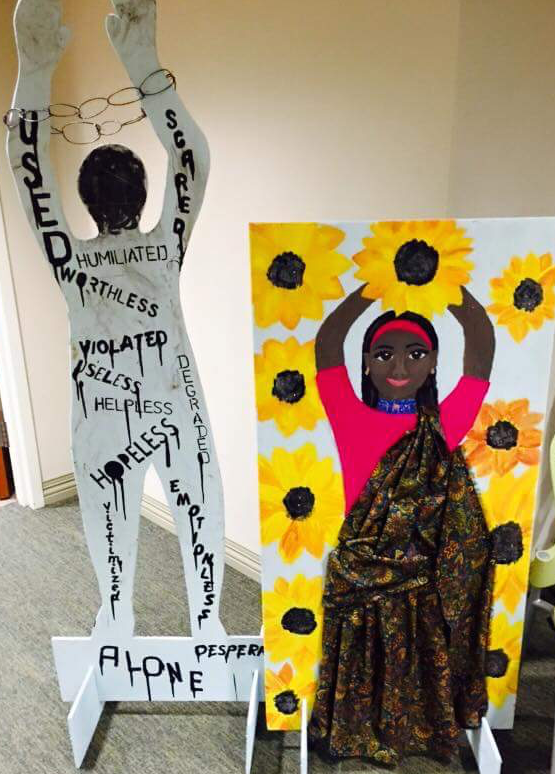 The groups embellished the silhouettes to depict victims of human trafficking. Professional artists judged the work, and cash prizes were awarded. One silhouette depicted a human trafficking victim bound in ropes with the notice “not for sale.” Another showed the insides of a human body and explained that some people are trafficked to harvest their organs for transplant. The silhouette that attendees voted “Fair Favorite” was covered with broken glass, depicting the true story of a victim trying to put her shattered life back together. Our guest speaker about Fair Trade issues, rabbinic intern Sarah Barasch-Hagans, discussed how important it is in Jewish tradition to free the slave and raise up the poor and the downtrodden. Sarah told us that most cacao used in making chocolate comes from Africa, and almost all of it is grown by people trapped in slavery. Many of them are children, even as young as five years old. Therefore most Fair Trade chocolate is sourced from Central and South America, where the cacao is grown by small farms with independent farmers who work under safe working conditions and earn a fair wage for their labors. Sarah also discussed how the Fair Food movement began among tomato workers in Florida twenty years ago. The workers initiated a protest against wages well below minimum wage; unsafe working conditions in fields without shade, water, or toilet facilities; sexual harassment; and horrible living conditions. Aided by faith-based groups, especially Sarah’s organization T’ruah: The Rabbinic Call for Human Rights, the Coalition of Immokalee Workers (in south Florida) was born. In a few short years the Coalition was able to obtain the support of Walmart and almost all fast food chains (with the exception of Wendy’s) to only purchase tomatoes that were certified Fair Food. The Immokalee coalition is continuing to pressure Wendy’s to sign on to the agreement, and is now expanding their efforts beyond tomatoes to include strawberries and peppers. We were able to obtain extensive press coverage, so the event and its message reached thousands of readers.